Extension ladders are great for reaching high places or granting access to roof tops, but I have never been a fan of having to swing around the side of the ladder to step off. One thing that eases my mind is knowing that the ladder is properly tied off according to Cal-OSHA regulations, but that is just part of the solution. 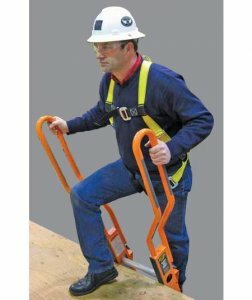 The Safe-T hand rail system has a new method that allows users to step through the ladder instead of swinging around it. The Safe-T extension system simply attaches to both sides of the ladder, past the last step, and extends the side rails enough to allow a person to step through. The extensions meet OSHA's requirement of extending a ladder more then 3-feet above a landing, and lock into place with a safety latch. Cushioned pads on the back of the extension help protect the eave of the roof, and hand grips provide that extra bit of user security. At $150, the Safe-T Ladder Extension System is not for everyone, but serious ladder users might what to consider it.